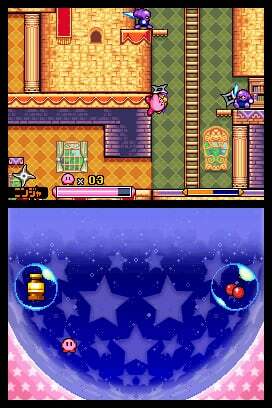 Does Kirby still have the old magic or is he just full of air? The old adage "don't judge a book by its cover" holds true in many formats. Encompassed by that is essentially everything we deal with, and the ultimate lesson is to avoid judgment based on appearances. Needless to say, it also applies to games. To simply glance at the Kirby series, you might assume that it's created for kids because - admittedly - the design seems somewhat childish. Yet amazingly, as you play one of the games of this franchise, you'll see it from an almost entirely different perspective. These titles certainly have an amazing quality to them, and in the latest iteration on the DS, Kirby Squeak Squad, you'll see exactly what I mean. To see a subtitle like Squeak Squad and not make a harsh judgment from the get-go is somewhat challenging. Try to keep an open mind though; this is actually quite a good game. Kirby Squeak Squad doesn't break any bounds in innovation, but it has a hearty, solid and ultimately fun platforming formula. As was the case with most Kirby games of old, the challenge of Squeak Squad comes not so much from falling to your demise. Rather, your health meter will serve as the primary problem causer. You can puff up and float mid-air at practically any moment to save yourself from an impending fall to your death, yet taking on the game's enemies is not so cut-and-dry. This isn't to say that challenge has been placed solely onto your foes, and eliminated from the level design. In fact all evidence is to the contrary. As most Kirby fans know, the clincher in each game will undoubtedly come through completing their file in full percentage. In Squeak Squad, accomplishing that will mean scavenging the adventure's 120 treasure chests scattered through the levels. On its own, it's not a very lengthy title, but with the addition of collecting the goodies along the way you'll be in for a decently lengthy outing. Like most Nintendo games, at least in this genre, Squeak Squad has little to call a story. Basically a mysterious band of mouse thieves known as the Squeaks steal Kirby's cake, and he goes off to retrieve it. Yeah, I don't get it either. It's not the worst attempt at a story I have seen, but it could have definitely been better. It's just important to remember that games like this thrive on their gameplay, not on the tale that accompanies it. For those who don't know, Kirby is a bit of a shape shifter. By inhaling his foes, he can imitate their abilities. Although Squeak Squad really doesn't add much to that concept, it does include a plethora of techniques for you to use. Just about every ability from previous adventures are here, plus a few new ones for kicks. Animal Kirby for instance can burrow through soft dirt, and Bubble Kirby can transform the baddies into storable bubble items. Defeating enemy's can be accomplished with just about any ability you have, but the levels often have puzzles that require specific skills that you'll need to use. If you can't beat 'em, eat 'em. As with each addition to the series, Squeak Squad has a new gimmick that makes it stand out from the pack. 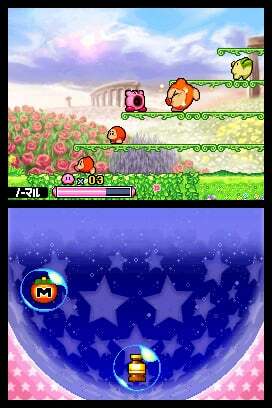 More specifically, you'll notice that the bottom screen sends direct-feed footage of all that goes on within Kirby's stomach. It sounds weird, and it is, but for a game that features a gluttonous marshmallow, it's hardly surprising to see it added in. The idea behind this all is to mix swallowed items on the fly. Potentially, this could be a good successor to the item-mixing gimmick in Kirby 64, but it isn't quite that. What the second screen really comes down to is a storage area. There is some ability mixing involved, but it's too shallow to be worthy of a mention. The developers had good intentions; they just weren't completely fulfilled. Your controls work on par with what you'd expect. The A button performs a jump, the B button uses Kirby's inhale ability or the ability itself if you have it applied, and the Select button will scrap your current ability if you get tired of it. It's all very easy to use, and most importantly is incredibly responsive to the action on-screen. The biggest change here is in the touch screen. 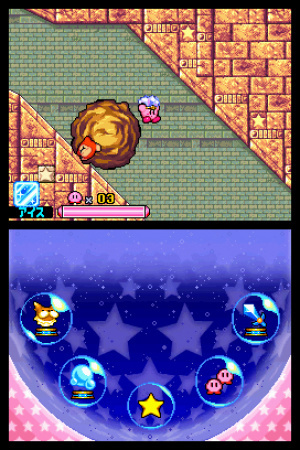 Although you won't be controlling Kirby himself with it per se, you will be dragging around items inside him. The developers have made this easy enough to perform with your fingers, but if you're like me you'll have reservations about smearing your hand all over your screen. I thusly found myself using the stylus, which was obviously a bit more awkward to do while using all of the buttons at the same time. That can't really be called as a fault though, seeing as how an alternative did exist which most people would readily use. One area of fault that can be justified however is the game's graphical presentation. Now I'm not one to nitpick on visuals, and to be perfectly honest it didn't bother me in the least. Yet it should still be known that the game could easily work on the Gameboy Advance, and as such there are going to be some disappointed players. Thankfully, the sprite work and the animation looks excellent, making you overlook the faults to some degree. It's disappointing to see games that don't quite meet the standard, but it's not a game-breaking element by any stretch of the imagination. The same goes for the sound and music in Squeak Squad. As is the case with every game in the series, there are some excellent tracks to be found here. Many are remixed versions of classic songs, and the new content fits right in. The problem is not quality of the music, but rather the actual audio quality: it's not so hot. This bit disappointed me a tad more, since music means so much to me in a game. It essentially sounds like you're playing a GBA game on your DS. Not a crucial error, but certainly a disappointment. The biggest flaw of Kirby Squeak Squad is without a doubt, the lack of any true advancement. Hal usually makes it their effort to include something very fresh for each new game. Yet Squeak Squad seems to lack that advantage. The touch screen item-mixing element had some potential, but it really wasn't reached. Now, putting that aside, you still have a formula that's just as fun as it was when Kirby first entered the market. If you can settle for a reiteration of the tried and true formula, then you're going to love this game. Kirby Squeak Squad doesn't break any new ground, and it plays it safe for the most part throughout the short length of the experience. Still, it's an excellent little platformer, and one of the best games I've played on my Nintendo DS in a while. It's nothing we haven't seen before, but it still feels surprisingly refreshing due to the quality packed into it. It's sometimes difficult to keep myself interested in a game from start to finish, but thankfully Squeak Squad was enjoyable enough to accomplish that. Partly due to its short length? Perhaps, but it was a fun experience nonetheless. 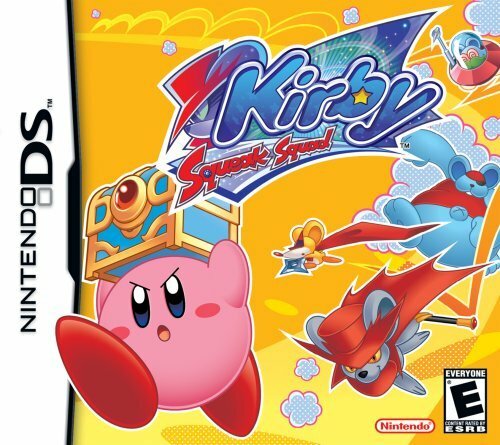 Kirby may appear childish, but his games are nothing short of amazing, and Squeak Squad is no exception. I'll definitely be picking this up. Kirby has been one of my guilty pleasures ever since the early days of the Game Boy. 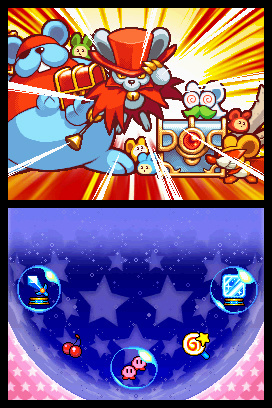 I've really enjoyed Kirby Squeak Squad. I never get tired of the Kirby titles and as long as Nintendo keep putting them out, I'll keep buying them. Squeak Squad is a fun, solid platformer. Not hard in the least but it's a very relaxing gaming experience with plenty of delightful, bright Kirby visuals, cool power-ups and the usual jaunty Kirby soundtrack. Very much worth playing for platforming fanatics. I'm with Corbie: So long as they keep making Kirby platformers, I will absolutely keep playing them. Spot-on review. Squeak Squad was cool, I probably like it more than SSU, since this is short and awesome. SSU is just meduim length and sweet. DOSE KIRBY squeak?! lol maybe thats why its called that name whatever. i have no idea how squeak squad got a higher rating than kirby 64, i beat squeak squad in ONE SITTING, all chests, everything. It took me months to beat kirby 64, and I had a blast while doing it. I LOVE KIRBY. This is the first Kirby game I got on the DS and I loved it from start to finish. I still sometimes play it, as it is very addictive and who doesn't love Kirby? Honestly, it's near impossible to not love Kirby.